Biofilms formed on the tooth surface is called as dental plaque. Bacteria proliferating in the dental plaque form the main etiologic factors for the majority of the dental ailments, e.g., caries, gingivitis, periodontitis, and periimplantitis. Microbial attack has been cited as the main cause of the dental implant failure. Biofilms are responsible for their association of about 65% of diseases including peri-implantitis and periodontitis. The review addresses the pathogenesis, factors affecting implant biofilm, and the treatment associated. The formation of the microbial complex called biofilm in the oral cavity is a multistage journey. Saliva provides the major source of nutrients to the bacteria. The thin film covering the tooth called as acquired pellicle is derived from the salivary proteins and covers the enamel within seconds after brushing. Proteins and the glycoproteins are the molecules binding to the tooth surface, implants, restorations, etc., These molecules primarily act to promote the adhesion and coaggregation of the oral bacteria. The bacterial adherence to the pellicle is facilitated by the special surface molecules (adhesins) chiefly lectins present on the bacterial cell surface. Further intercellular bacterial adhesion and secretion of the extracellular polysaccharides, e.g., levans, dextrans, form the multilayered bacterial colonies suspended in the polymer matrix. Slow aggregation of the bacterial colonies leads to the formation of the multilayered cell clusters in the polymer matrix. The microbial load in the saliva constitutes about 10  bacteria per milliliter. The bacterial cells colonize on the tooth surface within 4 hours of the pellicle formation. The initial colonizers being the Streptococci (S. viridens, S. mitis, S. oralis). The planktonik bacteria that are unable to bind directly to the tooth surface take the aid of their receptors to bind to the cell surfaces of the initial colonizing bacteria and finally on to the tooth surface. This bacterial cell to cell reaction that occurs or the coaggregation happens to be an important mechanism leading to the bacterial colonization and dental biofilm formation. Secondary colonizers bind to the bacteria predominantly comprising of the Actinomyces species, S. mutans, S. sobrinus. The bacteria multiply and co aggregate with the partner species. Fusobacterium nucleatum has the property to co-aggregate with multiple bacteria hence this species is an important link in the dental biofilms bridging the early and the late colonizers. The oral bacteria thrive for their nutrient supply from saliva, gingival crevicular fluid, sugar rich food metabolic products of other bacteria, and food debris. The mature plaque has an inherent "circulatory system." The plaque begins to behave as a complex microorganism. Metabolic products and evulsed cell wall constituents (lipopolysaccharides, vesicles) activate the host response [Figure 1]. Specialized cell-cell communication is exhibited by the bacteria that coordinate the gene expression. This communication is passed on as signals. Bacteria sense the changes in the local environment (cues) and receive the information of the adjacent population. Specific interspecies communication within the biofilms is mediated through the metabolic exchange, genetic exchange, and the quorom sensing. Quorum sensing is genetically governed chemical communication among bacteria in response to cell density and influence several functions of the bacteria, e.g., virulence, acid tolerance, and the biofilm formation. Two specific signaling molecules have been produced by the oral bacteria. Gram-positive bacteria communicate via small diffusible pepitide channel called as "Competence Stimulating Peptides (CST) and AI-2." AI-2 (autoinducer-2) is a popular signaling molecule exhibited by both gram-positive and gram-negative bacteria responsible for the quorum sensing. , The biofilm acts as a barrier for the bacteria against host immunity and the antimicrobial agents. The anaerobic microflora succeeds to occupy the subgingival environment gradually as the plaque starts maturing. Supragingival plaque sets up the stage for the disease process of gingivitis and the subgingival microbial colonies advance the gingivitis to an established form of periodontitis. Burgers et al. reported a twofold in vivo and in vitro study that aimed at bacterial adhesion on the different textured implant surfaces. In this study, machined and acid-etched titanium specimens (Ra 0.15 and 0.95, respectively) were worn for 12 hours by the subjects. The study aimed to investigate the bacterial growth of S. sanguinis after being incubated in the microbial suspension. The microbial growth was observed with fluorescent techniques. Results revealed a higher bacterial adhesion on the acid etched surface. Surface roughness Ra >0.2 μm leads to increased rate of the biofilm formation and hence acts as the main etiology behind the peri-implant breakdown. However, Ra <0.2 μm has no impact on the supra and subgingival plaque formation. It has further been explored and reported that Ra <0.02 μm has further no quantitative or qualitative effect on the nature of the microflora  [Table 3]. A majority of the studies have pointed out the comparative rates and the composition of the microbiota associated with teeth and implants in health and disease. The microbiota in healthy peri-implant tissues is dominated with gram positive facultative cocci and rods. A classic difference in the microbial profile of the peri-implant microflora in certain in vitro studies reveals affinity of the Staphylococcus aureus for the titanium surface but it isn't a common microflora around the teeth. The two-piece implant consists of an implant abutment junction (IAJ).There is a joint/gap between the implant and abutment referred as the "microgap." The histologic aspects of this microgap were studied by Ericsson et al., who identified two important microbiologic entities in the implant crestal region: (a) Plaque-associated inflammatory cell infiltrate (PaICT) and (b) implant-associated inflammatory cell infiltrate (IaICT). The microgap has been reported to be as high as 40-60 μm  It allows micromovement during function  and permits microleakage of fluids congenial for bacterial growth. Several studies have reported the bacterial penetration across the implant abutment interface. , An in vitro analysis for the possible microleakage at the implant abutment interface was carried out on the implant abutment assemblies in a blood serum media previously inoculated with microorganisms. After 7 days of anaerobic incubation of the partial or completely immersed implants in the medium, the microorganisms from the internal part of the implants were collected and incubated on the blood agar plates under anaerobic conditions. 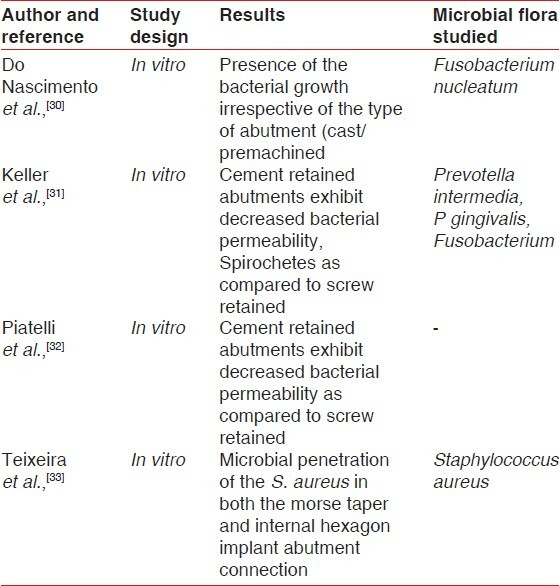 Microorganisms were found in both the assemblies indicating bacterial leakage at the implant abutment interface. The conclusive remarks of the study reveal that the IAJ is a potential source of microbial contamination which affects the health and integrity of the biologic tissues (bone and soft tissue) around the osseointegrated implant. Biofilm formation is an inadvertent phenomenon to occur around the implant. Stringent maintenance therapy is the cornerstone of successful implantology. Systematic monitoring of the clinical and radiographic parameters, i.e., the presence of plaque and calculus, bleeding on probing, probing depths, presence/absence of suppuration, and radiographic evaluation, is important to assure the peri-implant health. Based on the periodic diagnosis, CIST protocol  was recommended. The recently introduced PIMI system  emphasizes the importance of prognosis while deciding the treatment plan. Several pure metals, e.g., iron, titanium, nickel, exhibit bacteriostatic property. In an in vitro study done to check the antibacterial property of titanium with amalgam on the microbial strains of S. sangius, S. mitis, A. naeslundi, and Fusobacterium species revealed a weak antibacterial effects of titanium versus gold. However, several orthopedic studies have documented the use of antibiotic coating on the implant surface in order to widen the antibacterial spectrum of titanium. These studies give a new dimension in the possible role of the antibiotic coatings to provide an antibacterial barrier against microbial colony. Management of the biofilms has a multilevel approach: (1) Prevention of the microleakage at the IAJ thus limiting/eliminating the biofilm ingress; (2) treatment of the biofilm-related infections. Implant biofilm can lead to infection at two levels: Mucosal level (peri-implant mucositis) described as inflammatory lesion residing in the mucosa and bone level (peri-implantitis) which is explained as inflammatory lesion affecting the supporting tissues. The management of peri-implant infections aim at reduction of inflammation, pathogenic bacterial load and the probing depths. Biofilms related to dental implants are best treated through debridement of the contaminated implant surface (mechanical/laser/photodynamics, etc.,) or the antimicrobial therapy with local or systemic antibiotics [Table 4]. Decontamination of the implant surface is challenging for a predictable treatment outcome. Nonsurgical mechanical therapy has been found effective in reducing the microbial load with enhanced results when combined with the antimicrobial rinse in the peri-implant mucositis lesions. Various systemic local drugs, e.g., minocycline, tetracyclines, have shown promising results by decreasing the levels of the P. gingivalis T. forsythia, A. actinomycetemcomitans., Laser-assisted therapy for the management of the biofilm-related infection has also been documented in the literature with satisfactory results. Photodynamic therapy, using low level lasers, has been used to decontaminate the infected implant surfaces. Hayek et al. in an animal study reported an effective reduction of the microbial count of Prevotella species, Strep hemolyticus on subjecting to the photodynamic therapy. Photodynamic therapy and the regenerative periodontal treatment (autogenous bone graft) help in significant regeneration of the peri-implant bone defects. An in vivo study examining the microbial profile of A. actinomycetemcomitans, P. gingivalis, P. intermedia before and after photodynamic therapy on the infected implant surfaces in 15 human subjects revealed a significant reduction in the bacterial species as observed from baseline. IAJ is a vulnerable area for biofilm-related infections. Innovative implant abutment designs have helped reducing the microleakage at the IAJ with the sequential decrease in the microbial growth at the microgap. Platform switch, use of tapered implants deceases or eliminates this probable microbial ingress. Any micro-structured part that is exposed to the oral cavity should be highly polished to generate a anti-plaque adhering surface. The principles of plaque maintenance around the implant are similar to those performed around the teeth with some basic differences. The oral antimicrobial rinse (e.g., chlorhexidine) can be advised as a daily regime for implant patients but fluoride mouth rinses should be avoided with the possible risk of surface damage to the titanium abutments. The plastic-coated scaling tips (ultrasonic and hand scaling) should be used to avoid the risk of surface scratches on the abutment as caused with metal instruments. Light intermittent forces should be applied to the abutment surface while polishing after scaling. 1. Wilderer PA, Charakalis WG. 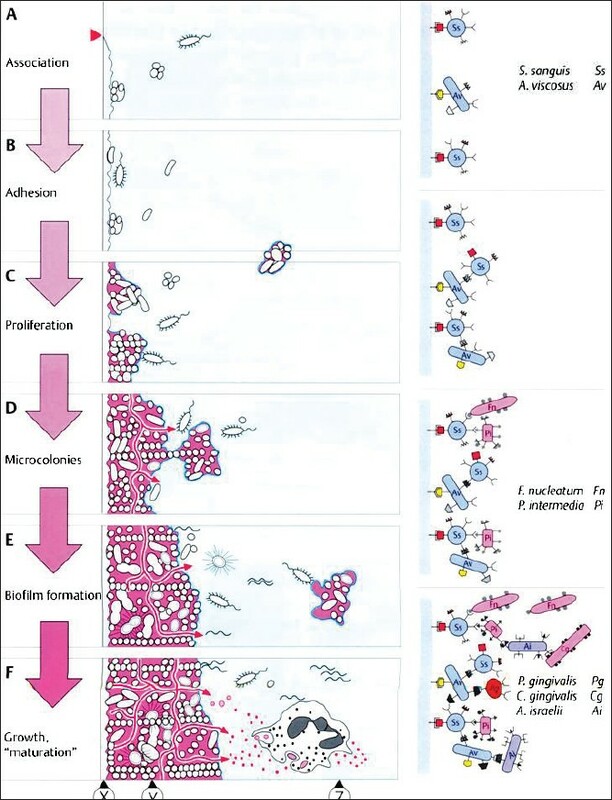 Structure and function of biofilms. In: Charakalis PA. editors. In structure and function of biofilms. Chichester, UK: JohnWiley; 1989. p. 5-17. 2. Costerton JW, Montanaro L. Biofilm in implant infections: Its production and regulation. Int J Artif Organs 2005;28:1062-8. 3. Kolenbrander PE, Palmer RJ Jr, Jakubobics NS. Bacterial interactions and successions during plaque development. Periodontology 2000 2006;42:47-79. 4. Paquette DW, Brodala N, Williams RC. Risk factors for endosseous dental implant failure. Dent Clin North Am 2006;50:361-74. 5. Buser D, Merickse-Stern R. Long term evaluation of nonsubmerged ITI implants. Part 1: 8 year life table analysis of a prospective multicenter study with 2359 implants. Clin Oral Implant Res 1997;8:161-72. 6. Wolfe HF. Biofilm plaque formation on tooth and root surfaces. In: Wolfe HF, Rateitschak KH, editor. Periodontology, Stuttgart: Thieme; 2005. p. 24-30. 7. Gibbons RJ, Van Houte J. On the formation of dental plaques. J Periodontol 1973;44:347-60. 8. Saxton CA. Scanning electron microscopy study of the formation of dental plaque. Caries Res 1973;19:111-23. 9. Kolenbrander PE, Anderson RN, Blehart DS. Communications among oral bacteria. Microbiol Mol Bio Rev 2002;66:486-05. 10. Hojo K, Nagaoka S, Oshima T. Bacterial interactions in dental biofilm development. J Dent Res 2009;88:982-90. 11. Bassler BL, Wright M, Silverman MR. Multiple signaling systems controlling expressions of luminescence in Vibrio harveyii: Sequence and function of genes encoding a secondary sensory pathway. Mol Microbio 1994;13:273-86. 12. Rams TE, Link CC. Microbiology of failing dental implants in humans. Electron microscopic observation. J Oral Implantol 1983;11:93-100. 13. Kalykakis GK, Nissengard R. Clinical and microbial findings on osseointegrated implants, comparison between partially dentate and edentulous subjects. European J Prosthod Rest Dent 1998;6:155-9. 14. Tanner A, Maiden MF, Lee K. Dental implant infections. Clin Infect Dis 1997;25:S 213-7. 15. Li J, Helmerhorst EJ, Socransky SS. Identification of early microbial colonizers in human dental biofilm. J Appl Microbiol 2004;97:1311-88. 16. Furst MM, Salvi GE, Lang NP. Bacterial colonization immediately after installation of oral titanium implants. Clin Oral Implants Res 2007;18:501-8. 17. Steinberg D, Klinger A, Kohavi D. Adsorption of human salivary proteins to titanium powder. Adsorption of human salivary albumin. Biomaterials 1995;16:1339-43. 18. Quireynen M, Vander Mei HC, Bollen CM. The influence of surface free energy on supra and subgingival plaque microbiology. An in vivo study on implants. J Periodontol 1994;65:162-7. 19. Rimondini L, Fare S, Brabilla E. The effect of surface roughness on early in vivo plaque colonization on titanium. J Periodontol 1997;68:556-62. 20. Grossner-Schreiber B, Greipentrog M. Plaque formation on surface modified dental implants. An in vitro study. Clin Oral Implant Res 2001;12:543-51. 21. Scarano A, Piattelli M, Caputi S, Favero GA, Piattelli A. Bacterial adhesion on commercially pure titanium and zirconium oxide disks: An in vivo human study. J Periodontol 2004;75:292-6. 22. Burgers R, Gerlach T, Hahnel S, Schwarz F, Handel G, Gosau M. In vivo and in vitro biofilm formation on two different titanium implant surfaces. Clin Oral Implants Res 2010;21:156-64. 23. Bollen CM, Papaioanno W, Van Eldere J, Schepers E, Quirynen M, van Steenberghe D. The influence of abutment surface roughness on plaque accumulation and peri-implant mucositis. Clin Oral Implants Res 1996;7:201-11. 24. Quirynen M, Bollen CM, Papaioannou W, Van Eldere J, van Steenberghe D. Influence of titanium abutment surface roughness on the plaque accumulation and gingivitis. Short term observation. Int J Oral Maxillofac Implants 1996;11:169-78. 25. Mombelli A, Lang NP. Microbial aspects of implant dentistry. Periodontology 2000 1994;4:74-80. 26. Buser D, Schenk RK, Steinmann S. Influence of surface characteristics on bone integration of titanium implants. A histomorphometric study in miniature pigs. J Biomed Mater Res 1991;25:889-02. 27. Teughels W, Van Assche N. Effect of material characteristics and/surface topography on biofilm development. Clin Oral Implants Res 2006;17:68-81. 28. Quireynen M, VanDerMei HC, Steenberghe VD. An in vivo study of the influence of surface roughness of implants on the microbiology of the supra and subgingival plaque. J Dent Res 1993;72:1304-9. 29. Quireynen M, Marechal M, Steenberghe VD. The influence of surface free energy and surface roughness on early plaque formation. An in vitro study in man. J Clin Periodontol 1990;17:138-44. 30. do Nascimento C, Barbosa RE, Issa JP, Watanabe E, Ito IY, Albuquerque RF Jr. Bacterial leakage along the implant-abutment interface of premachined or cast components. Int J Oral Maxillofac Surg 2008;37:177-80. 31. Keller W, Bragger U, Mombelli A. Periimplant microflora of implants with cemented and screw retained superstructures. Clin Oral Implant Res1998;9:209-17. 32. Piattelli A, Scarano A, Paolantonio M, Assenza B, Leghissa GC, Di Bonaventura G, et al. Fluids and microbial penetration in the internal part of cement-retained versus screw-retained implant-abutment connections. J Periodontol 2001;72:1146-50. 33. Teixeira W, Ribeiro RF, Sato S, Pedrazzi V. Microleakage into and from two-stage implants: An in vitro comparative study. Int J Oral Maxillofac Implants 2011;26:56-62. 34. Wu-Yaan CD, Egaanhouse KJ, Keller JC. Oral bacterial attachment to titanium surface: A scanning electron microscopic study. J Oral Implantol 1995;207-13. 35. Roth TA, Supppayak P. The surface and grain free boundary free energies of pure titanium alloy Ti-6Al-4V. Mat Sci Eng 1978;35:187-96. 36. Buser D, Schenk RK, Steinmann S. Influence of surface characteristics on bone integration of titanium implants. A histomorphometric study in miniature pigs. J Biomed Mater Res 1991;25:889-02. 37. Mombelli A, Van Oosten MA. The microbiota associated with successful or failing osseointegrated titanium implants. Oral Microbiol Immunol 1987;2:145-51. 38. Harris LG, Foster SJ, Richards RG. An introduction to Staphlococcus aureus and techniques for identifying and quatifying S. aureus adhesins in relation to adhesion to biomaterials: Review. Eur Cells Mater 2002;4:39-60. 39. Renvert S, Lindahl C, Renvert H. Clinical and microbiological analysis of subjects treated with Branemark or Astratech implants: A 7 year follow up study. Clin Oral Implants Res 2008;19:342-7. 40. Rams TE, Feik D, Slots J. Staphylococci in human periodontal disease. Oral Microbiol Immunol 1990;5:29-32. 41. Herrmann M, Lai QJ, Albrecht RM, Mosher DF, Proctor RA. Adhesion of Staphlococcus aureus to surface bound platelets. Role of fibrinogen/fibrin and platelet intergrins. J Infect dis 1993;167:312-22. 42. Socransky SS, Haffajee AD, Cugini MA. Microbial complexes in subgingival plaque. J Clin Periodontol 1998;25:134-44. 43. Blankenship JR, Mitchell AP. How to build a biofilm: A fungal perspective. Curr Opin Microbiol 2006;19:342-7. 44. Ericsson I, Persson LG, Berglundh T. Different types of inflammatory reactions in periimplant soft tissues. J Clin Periodontol 1995;22: 255-61. 45. Steinebrunner L, Wolfart S, Bössmann K, Kern M. In vitro evaluation of bacterial leakage along the implant abutment interface of different implant systems. Int J Oral Maxillofac Implants 2005;20:875-81. 46. Engelke W, Decco OA, Rau MJ, Massoni MC, Schwarzwäller W. In vitro evaluation of the horizontal implant micromovement in bone specimen with contact endoscopy. Implant Dent 2004;13:88-94. 47. Quireynen M, Bollen CM, Steenberghe V. Microbial penetration along the implant components of the Branemark system. An in vitro study. Clin Oral Implant Res 1994;5:239-44. 48. do Nascimento C, Pedrazzi V, Miani PK, Moreira LD, de Albuquerque RF Jr. Influence of repeated screw tightening on bacterial leakage along the implant-abutment interface. Clin Oral Implants Res 2009;20:1394-7. 49. Kalykakis GK, Nissengard R. Clinical and microbial findings on osseointegrated implants, comparison between partially dentate and edentulous subjects. Eur J Prosth Rest Dent 1998;6:155-9. 50. Karousis IK, Fourmousis I. A comprehensive and critical review of dental implant prognosis in periodontally compromised partially edentulous patients. Clin Oral Implant Res 2007;6:669-79. 51. Karousis IK, Salvi GE, Heitz-Mayfield LJ. Long term prognosis in patients with and without a history of chronic periodontitis: A 10 year prospective cohort study of the ITI dental implant system. Clin Oral Implants Res 2003;14:329-39. 52. Ong CT, Ivanovski S, Needleman IG. Systematic review of implant outcomes in treated periodontitis subjects. J Clin Periodontol 2008;35:438-62. 53. Heitz-Mayfield LJ, Lang NP. Comparative biology of chronic and aggressive periodontitis versus periimplantitis. Periodontology 2000 2010;53:167-81. 54. Lang NP, Berglundh T. Consensus statement and recommended clinical procedures regarding implant survival and complications. Int J Oral Maxillofac Implant 2004;19S: 150-4. 55. Nogueira-Filho G, Iacopino AM, Tenenbaum HC. Prognosis in implant Dentistry: A system for classifying the degree of periimplant mucosal inflammation. J Can Dent Assoc 2010;77:1-6. 56. Leonhardt A, Dahlen G. Effect of titanium on selected oral bacterial species in vitro. Eur J Oral Sci 1995;103:382-7. 57. Antoci V, King SB, Jose B. Vancomycin covalently bonded to titanium alloy prevents bacterial colonization. J Orthop Res 2007;25:858-66. 58. Lindhe J, Meyle J. Periimplant diseases: Consensus report of the Sixth European Workshop on Periodontology. J Clin Periodontol 2008;35:282-5. 59. Mombelli A, Lang NP. 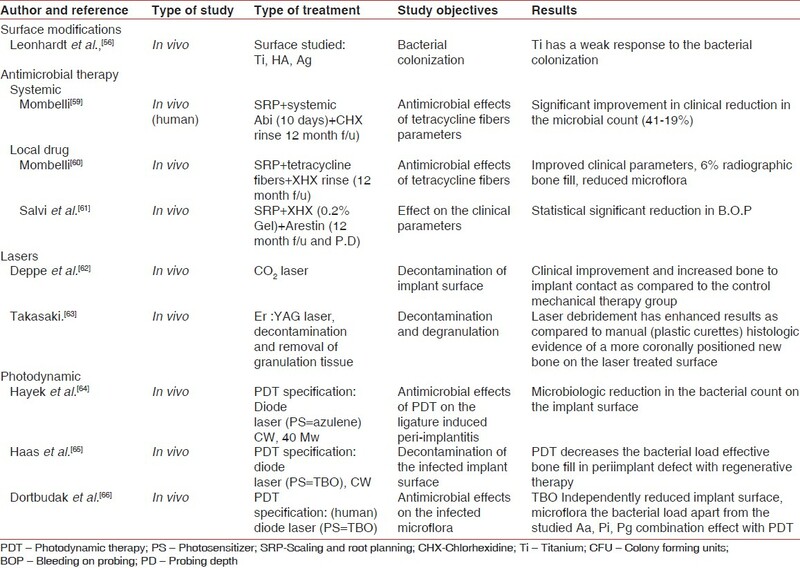 Antimicrobial treatment of periimplant infections. Clin Oral Implant Res 1992;3:162-8. 60. Mombelli A, Feloutzis A, Bragger U. Treatment of periimplantitis by local delivery of tetracyclines: Clinical, microbiological and radiological results. Clin Oral Implant Res 2001;14:404-11. 61. Salvi GE, Persson GR, Heitz-Mayfield LJ. Adjunctive local antibiotic therapy in the treatment of periimplantitis Clinical and radiographic outcomes. Clin Oral Implants Res 2007;18:281-5. 62. Depp H, Horch HH, Henke J. Periimplant care of ailing implants with carbon dioxide laser. Int J Oral Maxillofac Implants 2001;16:659-67. 63. Takasaki AA, Aoki A, Mizutani K. Er-YAG laser therapy for periimplant infections: A histologic study. Lasers Med Sci 2007;22:143-57. 64. Hayek RR, Araújo NS, Gioso MA, Ferreira J, Baptista-Sobrinho CA, Yamada AM, et al. Comparative study between the effects of photodynamic therapy and conventional therapy on microbial reduction in ligature induced periimplantitis. J Periodontol 2005;76:1275-81. 65. Haas R, Dortbudak O. Elimination of bacteria on different implant surfaces through hotosensitization and soft laser. An in vitro study. Clin Oral Implant Res 1997;8:249-54. 66. Dortbudak O, Haas R, Bernhart T. Lethal photosensitization for decontamination of the implant surfaces in the treatment of periimplantitis. Clin Oral Implants Res 2001;12:104-8. 67. Renvert S, Roos-Jansaker AM. Non surgical treatment of periimplant mucositis and periimplantitis. A literature review. J Clin Periodontol 2008;35:305-15. 68. Tara B, Taiyeb-Ali, Ong S, Siar C. Influence of abutment design on clinical status of periimplant tissues. Implant Dent 2009;18:438-46. 69. Mohn D, Zehnder M, Stark W, Imfeld T. Electrochemical disinfection of dental implants-A proof of concept. PLos One 2011;6:e157-61. Morawiec, T. and Dziedzic, A. and Niedzielska, I. and Mertas, A. and Tanasiewicz, M. and Skaba, D. and Kasperski, J. and Machorowska-PieniaÌ§zek, A. and Kucharzewski, M. and Szaniawska, K. and WiÈ©ckiewicz, WÅ‚. and WiÈ©ckiewicz, M.